James Willstrop is well known for his love of the theatre. He has added another string to his bow by appearing in his very own movie. 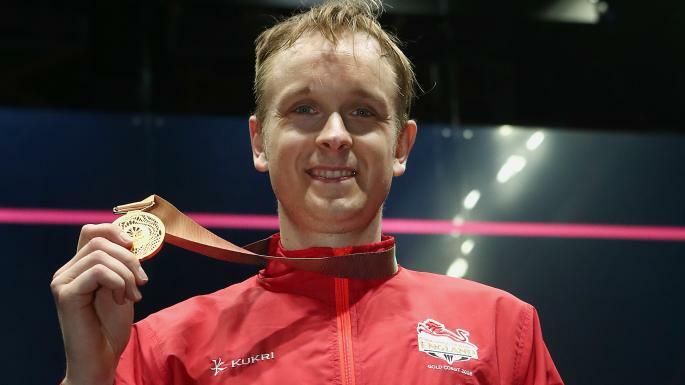 The Marksman, a film about Willstrop’s life and career, was commissioned by England Squash to celebrate his gold medal triumph in Australia last summer. Launched on the eve of the 2019 National Championships in Nottingham, one hopes it is not the precursor of an imminent announcement that he is to retire from a sport that has given him legendary status and a talent for delivering moments of artistic and creative genius. I spent a fair bit of time watching Willstrop when he achieved the world number one ranking in 2011. Always known as an entertaining player, Willstrop knew that, to achieve success at the highest level, he had to adopt a more pragmatic approach. Entertaining play usually involves opening the court up for your opponent. Playing tighter shots restricts your opponent’s options and if you can force an error, or a loose return, it gives you the opportunity to finish the rally in style. Willstrop’s ability to hit backhand clingers, whether drives, drops, volley drops or shots that amounted to floated straight lobs, saw him become a master of precision. In one match, during the North American Open in Richmond, Virginia, he was almost unplayable. Even when up against the mercurial talent of Egyptian Ramy Ashour. During one short passage of play, I recall Willstrop playing a series of tight backhand shots to the front left-hand corner that were either clear winners or were so tight that Ashour, in scraping the ball off the side wall, gave away a penalty stroke. A three-quarter length ball was glued to the wall leaving Ashour with nothing to hit. Bizarrely, after each round, Willstrop would apologise to the audience for playing boring squash! Although born in Norfolk, Willstrop had clearly immersed himself fully in a new character role, playing the stereotype of a dour, parsimonious Yorkshireman to perfection. A year or so earlier, he had fallen out of love with the game so badly that after-match interviews, that once glowed with intelligence, wit and charm, sometimes became awkward moments full of negative remarks. I first met James during the British Open in Aberdeen in 1999. He was working on the Hi-Tec stand. A few years later, and still a teenager, he joined me in the commentary team at the PSA Super Series Finals at the Broadgate Arena in London. He was good at it. Now a seasoned professional, he was clearly going through a tough time. Most players do, trapped inside a bubble where the only conversations revolve around squash. Later on, the risk of losing it all to injury clearly revived Willstrop’s love of the game. Nowadays, he has learned to cope with the psychological baggage that plays such a part of full-time professional sport. The training, the treatment, the travel, the triumphs, and the traumas of defeat no longer reduce him to the depths of despair. Marriage to Vanessa Atkinson and the arrival of two small children, and his love of theatre, have played a significant part in that reawakening. As he uttered the words: “You can’t let it get to you,” the film clip in the background showed one of many losses he suffered in succession to his Yorkshire and England rival Nick Matthew. The timing of that segment may have been accidental, but it certainly provided a subliminal reminder of the power struggle that gripped the attention of fans and defined a large part of the careers of both players. Willstrop’s theatrical reference segued perfectly to footage of him rehearsing his lines with Harrogate Dramatic Society. He said: “It was all down to me being injured. During my career I had rarely been at home for three months. I joined a group I had seen and just wanted to go and get involved. Earlier in the film he spoke about the moments of drama that have made him so popular in the game. I am talking, of course, about his uniquely crafted double and triple “fake” shots which have left opponents wrongfooted and audiences dumbstruck. He said: “Everywhere I go to play people ask me if I’m going to produce a ‘fake’ shot that evening. “Not long ago I played Karim Abdel Gawad and it was a damn good rally – a real lung-burster with lots of extra lunging. Suddenly the ball sat up and I did the triple fake. Back in Richmond, Virginia, on another occasion Willstrop had bamboozled Ashour while on match ball down with a similar piece of artistry. He may have lost the match, but that blissful moment of magic created some marvellous Marksman memories. In the film, Willstrop thanks his parents, Malcolm and Lesley, for inspiring his love of squash. Eleven years later he was thinking of his mother when he reached the number one spot in the world rankings. He explained: “I had won three tournaments back to back, Hong Kong, the Kuwait Cup and the PSA Masters in India. There were more tears of joy when Willstrop finally claimed a Commonwealth Games gold medal in Gold Coast in 2018. Four years earlier he and Nick Matthew had produced a brilliant final in Glasgow(won 3-2 by Matthew) when both players produced squash of a phenomenal standard despite both dealing with the effects of serious injuries. He added: “After surgery, one year later I was back on tour. I had to change my training to protect my hips. It was at this point that I realised just how much I loved the game. “I cringe at some of the things I used to do in training. You need to use your brain in squash. So, instead of court sprints, I decided I will make this as good as I can. The moment that will crown his career, unless he can pull out a spectacular triumph in the World Championship in Chicago, is of course his gold medal on the Gold Coast. This forms the crescendo of the film. Willstrop set the scene: “In the previous autumn I had suffered lots of losses. But I did not want to put pressure on myself. I just wanted to be there in Australia. I was seeing the ball well, I was match sharp, I was doing all my rehab well, and I beat Gawad, the previous year’s world champion, which was a massive confidence booster. After a straight-games win over Malaysia’s Nafiizwan Adnan (who had ended Nick Matthew’s hopes of a final gold medal) Willstrop found himself in the final against one of the fittest men on the planet, New Zealand’s Paul Coll. Coll’s escapades against Willstrop at Canary Wharf the previous year had gone viral, with three stunning retrieval shots in the same rally which culminated in Willstrop hitting the ball into the tin and clearly not knowing whether to laugh or cry. It was one of the most-viewed clips in squash history and another big TV audience tuned in to watch this battle unfold in Australia. Willstrop said: “I felt tired on the morning of the final and didn’t have much of a warm-up. I simply knew that I had to do everything I knew about hitting a squash ball, placing a squash ball … and being prepared to run through a wall to win. “I felt the same as I had before I played Gregory Gaultier in India (to claim the world number one slot). I am prepared to die here. “In the end, I did not have to go to the well. After the Pilley match I did not expect to win the next two 3-0. I was playing tight squash but from 7-2 up Coll started to whittle the points away. At 7-6 I had to remind myself that I would have taken that at the start of the match and simply played each rally on its merits. “I got a stroke on match ball. I remember watching the video replay which showed the contact and I knew it was a stroke. After high fives and hugs from his team-mates (the final hug being shared by Daryl Selby and Nick Matthew) Willstrop made his way over to his manager, Mick Todd, who was in floods of tears at courtside. So many people were so proud of Willstrop’s achievement that day, and the way he had imposed the quality of his own play on the occasion, reduced many more to tears back home in the UK. England Squash chief executive Keir Worth introduced the screening of The Marksman at Pontefract on Friday evening and said: “It was a great occasion, really special for James and his family. We had a great and warm Pontefract welcome, with a Q and A session afterwards with James. David Campion and Vanessa said a few words, too. Malcolm stepped in as MC for the evening. It was a well-deserved tribute for James. Willstrop, who is aiming for another Nationals title in Nottingham during the next week, added: “I really enjoyed making this film and loved watching it and reliving the memories. “Film is a great vehicle for inspiring people and if this documentary can inspire some interest in the game then that really is a fantastic thing. The Marksman: Produced by Dair. Interviews by Producer Giles Mountford. Directed and Edited by Sera Pickering Pick. Commissioned by England Squash (2019).